Stella Dimoko Korkus.com: Lagos State Government Demolishes 13 Buildings After Lagos Building Collapse..
Lagos State Government Demolishes 13 Buildings After Lagos Building Collapse..
Five more structurally defective Lagos Island buildings were yesterday brought down by the Lagos State Government. 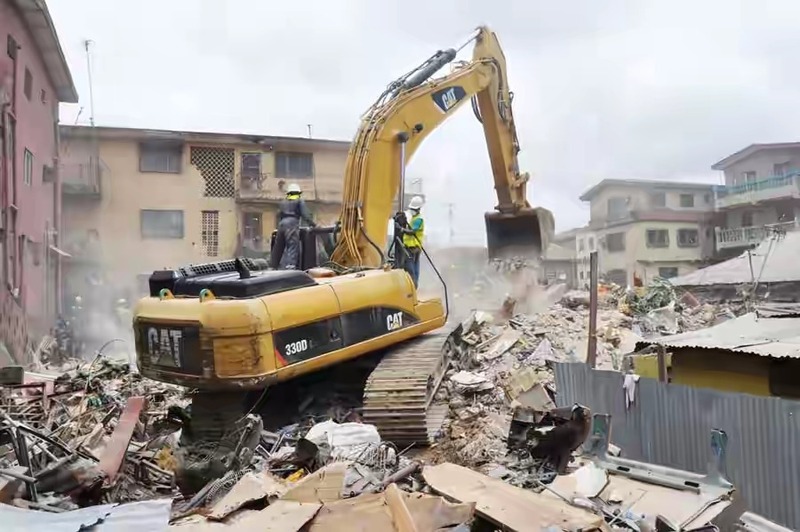 This brings the number of demolished buildings to 13 since Friday when the Lagos State Building Control Agency (LASBCA) started the exercise to prevent another disaster after Wednesday’s incident on Massey Street, Ita-Faji, Lagos Island. Commissioner for Physical Planning and Urban Development Prince Rotimi Ogunleye described the exercise as a holistic response to the challenges posed by derelict structures and unapproved schools. 45, John Street – all on Lagos Island. They joined eight others demolished on Friday and Saturday – 60, Freeman, 47 Smith, 16, Apatira, 28, Apatira, 39 Alli, 21, Okediji, 34 Seriki and 33 Ojo Giwa streets. *The whole of Lagos island is littered with 'dead' buildings waiting to collapse! Nice one!! bring them down,its better to cry now and relocate than cry later when there's no hope. Nice job! Please do extend action to Abraham Adesanya Estate, Ajah and jakande estate along Lekki-Epe Exp, as those buildings are defective. All these houses they are demolishing now, have the tenants made enough preparation to look for somewhere. They should check that island market very well too. So many dead buildings. Oyingbo and Apapa road too. Medicine after death. But it's good the buildings are demolished. It's not by force to live in Lagos. For those whose building has been demolished. The govt is only trying to save u from death trap. The developer who builds those houses is the problem in Lagos island. They undermine the cement they use and greed is their other name.